The controlled demolition of old buildings is always a fun thing to watch, especially when demolition experts do extremely accurate math in order to bring down huge structures. Just like in the case of the coal-fired Cockenzie power station in East Lothian, Scotland. 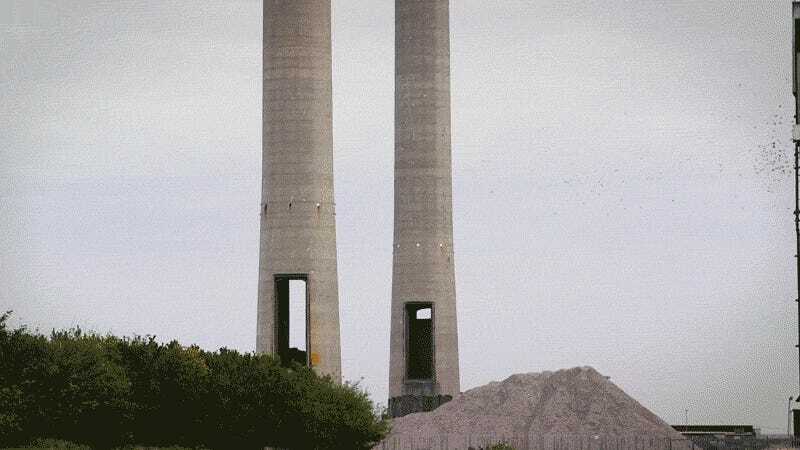 Cockenzie’s 487 feet (149 meters) tall iconic chimneys were demolished on Saturday by placing dozens of explosives into holes on the sides of chimneys so that they collapsed exactly into each other. Thousands of spectators watched the amazing event from a safe distance–bidding farewell to the one-time largest Scottish power station (and greeting much cleaner air with its demise).